The news comes as a surprise as Hungary's capital Budapest was considered favourite to stage the 17th edition of the event. The 2019 convention will take place at the Gold Coast Convention and Exhibition Centre - the venue for the Main Press Centre and netball matches at the Commonwealth Games in April - from May 5 to 10. "It is a pleasure to bring the SportAccord to the Gold Coast of Australia and I would like to thank the Government of Queensland for hosting SportAccord 2019," Global Association of International Sports Federations President Patrick Baumann said. "The 17th edition of SportAccord will be a special one, as it will help mark the one-year anniversary of the delivery of a successful Commonwealth Games and will provide the chance for our delegates to embrace all the qualities and opportunities the Gold Coast and Queensland has to offer. "It is a unique opportunity for the whole Oceania sports community to meet, interact and mingle with all international sports leaders in a focused and efficient way." The host of the 2019 Sport Accord World Sport and Business Summit was due to be revealed at the GAISF General Assembly during the 2019 edition of the event in April. But Baumann claimed at the time that a few more weeks were needed to confirm the location of the Summit. It marked the first time the a SportAccord Summit concluded without the following year’s hosts having been confirmed since 2015, when Sochi pulled out of its contract to host the next five editions following then SportAccord President Marius Vizer’s public criticism of International Olympic Committee President Thomas Bach, prompting several Federations to resign from the organisation. The 2016 event was eventually awarded to Lausanne, ending an eight-month search to find a city to stage the Olympic Movement's biggest conference and networking opportunity. Aarhus then played host in 2017, followed by Bangkok earlier this year. The 2019 Summit will be the first held in Oceania. Officials and local politicians in Gold Coast had vowed to use their hosting of the Commonwealth Games as a springboard to stage other major events. Over 1,500 participants are expected to descend on the Australian city for next year's event. "This is a great demonstration of the partnership we have built with the State over the past years," said Gold Coast Mayor Tom Tate. 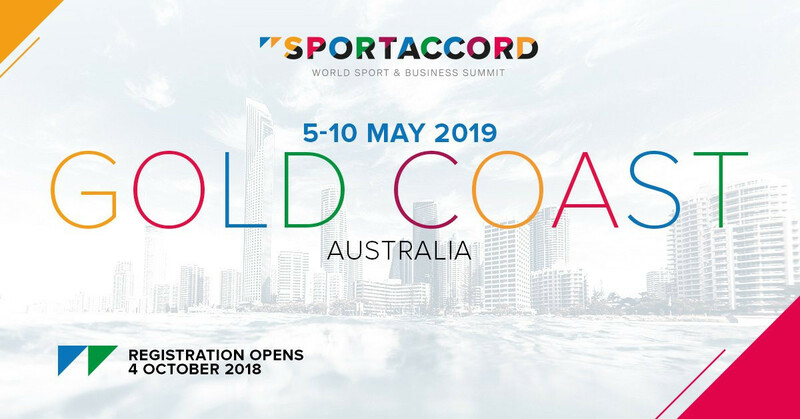 “Having SportAccord in our city will turbo charge the opportunities for the Gold Coast to further activate our sporting arenas, as well as our sports science and training facilities.